For years, we have done the Easter Egg scavenger hunt at Disneyland Resort. This week we did our first Walt Disney World Resort scavenger hunt: Chip & Dale’s Christmas Tree Spree! This scavenger hunt is at Epcot, throughout the World Showcase. You can find the maps with stickers for purchase throughout the park for $6.99. 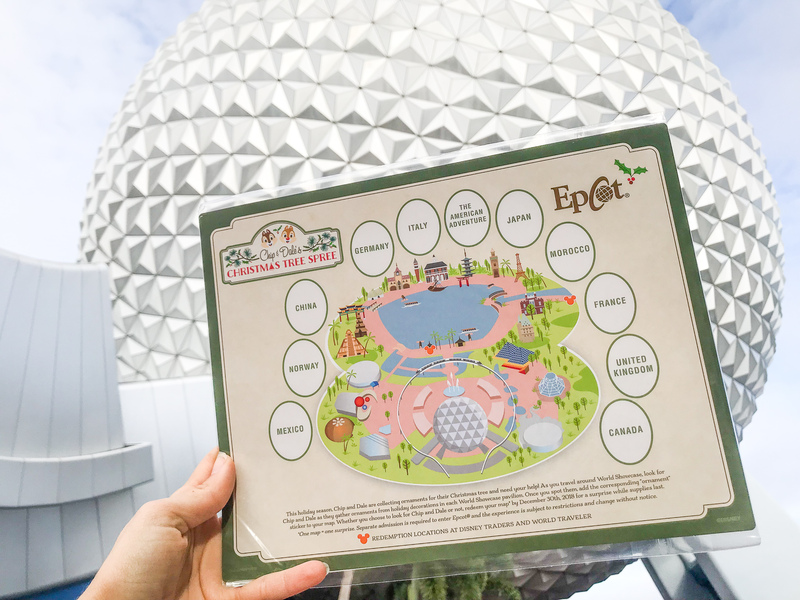 Included with the map are stickers of a different ornament that is representative of each pavilion’s holiday culture. At each pavilion in World Showcase, you will need to look for a wreath with Chip & Dale holding the special item, and then put the corresponding sticker on your map. The Easter scavenger hunt typically is very easy, so was pleasantly surprised that the Epcot scavenger hunt Chip & Dale’s Christmas Tree Spree was a bit of a challenge! The wreaths can be found indoors or outdoors, and often in high up places! It is even challenging for adults at times, making it a true family effort to be on the hunt for the special wreaths in each pavilion! (I’m not sharing the wreath pictures here since I don’t want to spoil the scavenger hunt!). What I loved about the wreaths is that each one contains flora and fauna from their respective regions, to go along with the culture of each pavilion. Once you have all your stickers placed on your map, you can visit Disney Traders (near the entrance of World Showcase) or World Traveler (near the boat dock between the United Kingdom and France pavilions) to redeem your scavenger hunt prize! You can pick between 3 different designs of paper cards, which come in a set of 3. Inside the card is a paper ornament. My daughter picked out the Christmas Figment ornament as her prize! She felt so proud to have completed the Chip & Dale Christmas Tree Spree scavenger hunt at Epcot! The scavenger hunt runs until December 30th or while supplies last.